My application to become an Oculus Quest developer was denied by Oculus. Update: To clarify my app will still be on the Oculus Quest via the web browser. This decision by Oculus only means that I won’t be able to use their tools to optimize my app for their platform. Since Oculus announced that they were setting a higher bar for content on the Oculus Quest. Journalists have been wondering what kinds of content might get rejected. “High-quality, innovative titles tend to be expensive to build, and developers need confidence that they are shipping into an ecosystem that will generate a return on investment. We’ve set a high bar for content quality on Quest, higher than we’ve ever enforced before, in order to build a platform where everyone has confidence in the quality of the titles they’re buying and developers know that their investments have a strong chance of success.” quoting Oculus at this link below. Would apps that dealt with queer content be rejected? Would WebXR magazines that were critical of Facebook be rejected? Now we know that this journalist’s pitch was rejected, but what did I pitch exactly? I pitched a webXR magazine to Oculus. I asked for an Oculus Quest so that I could tune my webXR magazine to the Oculus Quest. Slides from my three page pitchdeck to Oculus for a WebXR magazine. Click to see big. 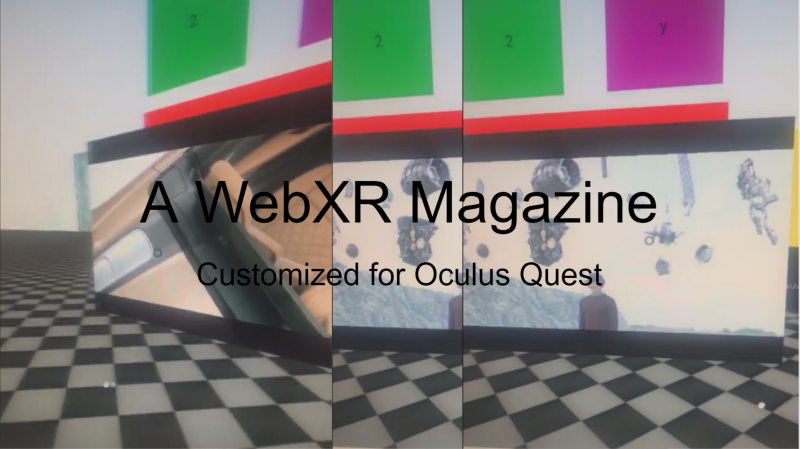 This a webXR magazine custom designed to work with Oculus Quest hardware, it’s intended to cover topics such as virtual reality, social networks, augmented reality, neuroscience, brain computer interfaces, artificial intelligence, blockchain technology and more. It’s based in Aframe/threejs technology so it can be served with a link and it will be available in AR by summer. It’s currently optimized to work with the Oculus Go controller. XR Magazines like this one are the future of journalism. They represent a way to introduce 3D models, 3D volumetric video interviews, photogrammetry scenes, videogrammetry scenes, 360 photos, 360 movies (interviews) and 3D 360 previews (and any 3D content that software/hardware VR companies may want to share with our readers) and also stories can be mapped out in a physical space, that requires the user to explore, interact, and see/learn a physical relationship mapped out by the journalist. News stories can be more immersive, and more engaging, and spatial relationships between ideas can be shown. 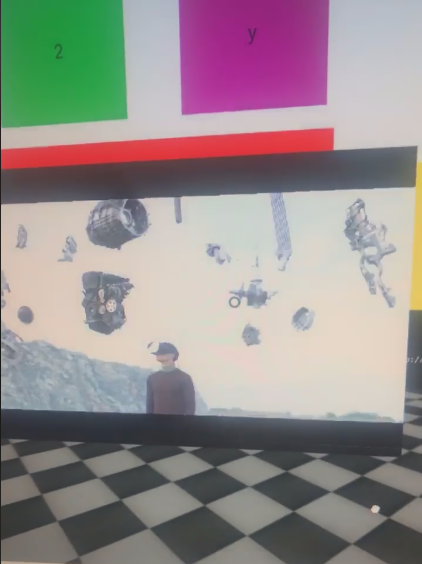 The journalist can also become an avatar or a 3D volumetric video, and its like inviting someone into your office to show them what you have learned, to describe the story as if you were there and had floating pictures, videos, etc with you. 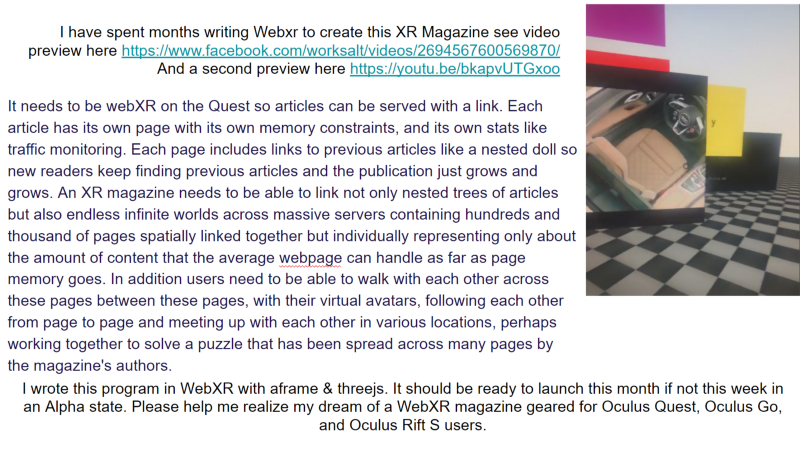 It needs to be webXR on the Quest so articles can be served with a link. Each article has its own page with its own memory constraints, and its own stats like traffic monitoring. Each page includes links to previous articles like a nested doll so new readers keep finding previous articles and the publication just grows and grows. An XR magazine needs to be able to link not only nested trees of articles but also endless infinite worlds across massive servers containing hundreds and thousand of pages spatially linked together but individually representing only about the amount of content that the average webpage can handle as far as page memory goes. In addition users need to be able to walk with each other across these pages between these pages, with their virtual avatars, following each other from page to page and meeting up with each other in various locations, perhaps working together to solve a puzzle that has been spread across many pages by the magazine’s authors. 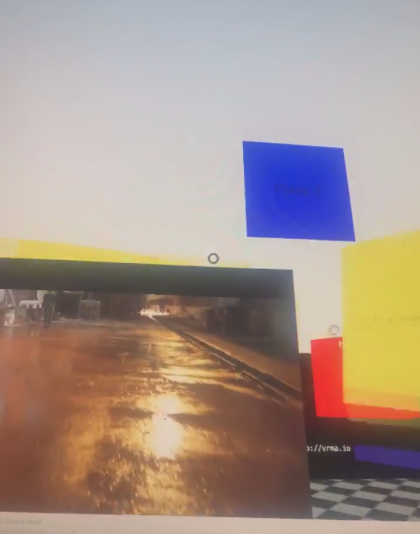 I wrote this program in WebXR with aframe & threejs. It should be ready to launch this month if not this week in an Alpha state. 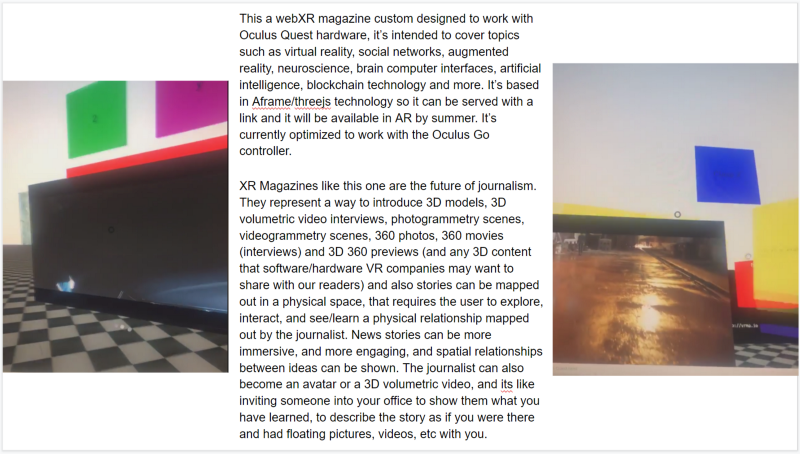 Please help me realize my dream of a WebXR magazine geared for Oculus Quest, Oculus Go, and Oculus Rift S users. “Thank for taking the time to submit your pitch. After a thorough review of your submission, your application has not been accepted to receive Oculus Quest publishing access at this time. We would, however, like to invite you to release your app for the Oculus Rift & Rift S.
The Rift & Rift S are the perfect environment to try new content, backed by the power of a modern PC, and the large PC-based VR audience. The Rift S is coming Spring 2019 with built-in Oculus Insight tracking technology, and improved optics. The same SDKs and documentation used to develop for Rift continue to work with Rift S — and Rift S will support the same content library as Rift, ensuring the largest possible audience for your current and future content. 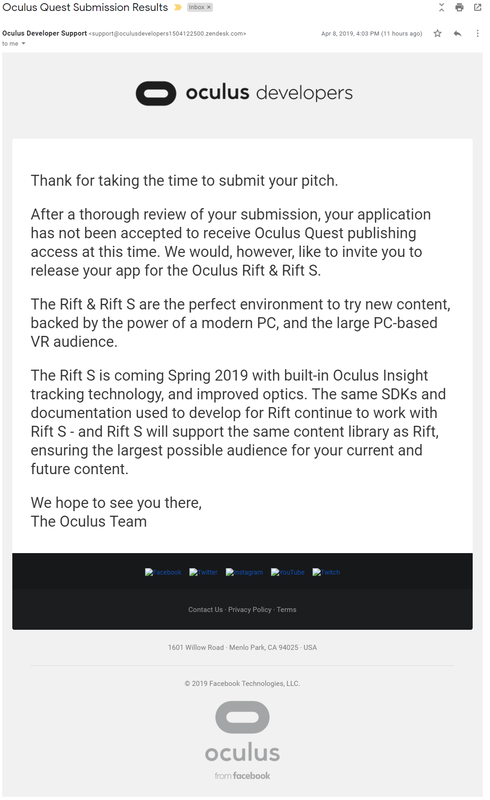 Here is the thing however, you said this “After a thorough review of your submission, your application has not been accepted to receive Oculus Quest publishing access at this time.” If you did a thorough review you would know that I’m writing a webxr application, and I know that at least Supermedium will becoming to the Oculus Quest, so via Supermedium my application will be published and accessible on the Oculus Quest. 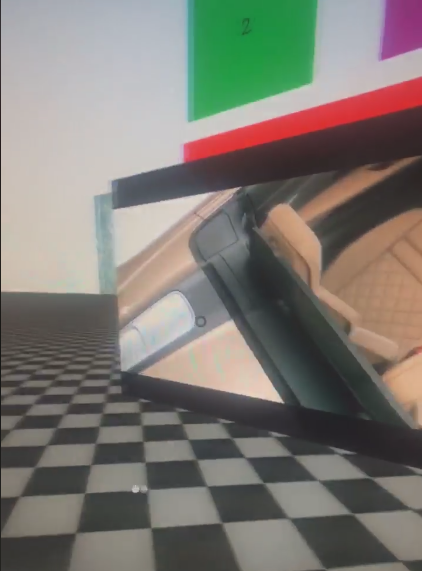 In addition if Oculus Quest is going to receive a version of the Oculus browser (which is most likely) then again my webxr application will consumable via the Oculus browser. 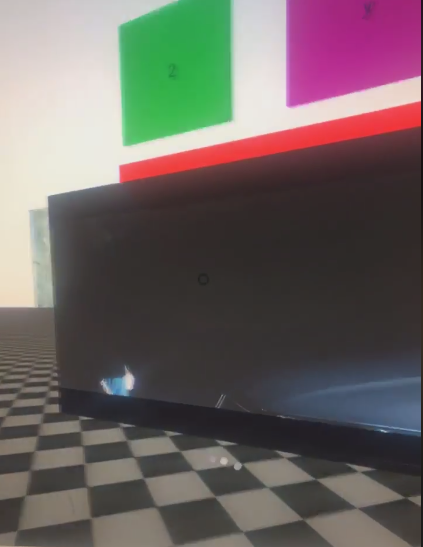 Either way webxr apps appear to on their way to the Oculus Quest. Each one will be as accessible as any website. So there is no Oculus Quest publishing approval that is needed. In that scenario it probably be in the interests of Oculus to help the less than 300 active contributing webxr developers in the world to optimize their webxr apps for the Oculus Quest. 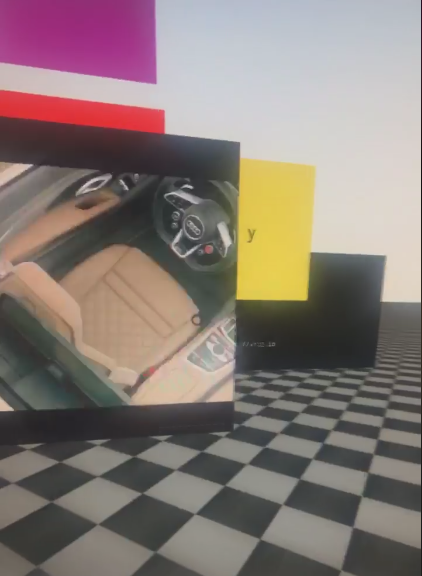 Final thought (not part of my response to Oculus): My WebXR Magazine works on the Oculus Go, and it because it’s based in WebXR it will work on most AR VR devices from Hololens 2, to Magic Leap with Exokit, to Valve Index, Vive Focus Plus, to Oculus Quest, and the people at Oculus can no more curate WebXR than they can curate the actual web. Oculus should support WebXR developers with Quests that they can optimize WebXR apps on. There aren’t that many webXR developers which makes each one of us extremely valuable. So if there are any companies or individuals out there that want to fund an awesome WebXR magazine let me know.